Some McHenry County College employees and students are continuing a timeless art form, all the while making a difference in the community. 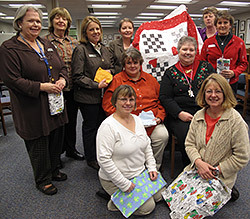 McHenry County College’s MCCQuilters Guild donated a total of 37 handmade quilts and 30 pillowcases to Public Action to Deliver Shelter (PADS) transitional home and Turning Point over the past year. In the past month alone, the two charities accepted 15 comfort quilts, 25 pillowcases, and one wall hanging from the MCCQuilters. The group’s mission is to serve McHenry County by making quilts and pillowcases for local charities, teaching others how to quilt, and practicing sustainability by using donated fabric to make the items. So far, the donated linens have saved 110 yards of fabric from going into landfills. "It is a fun, positive experience, and I’ve met other people around the College I didn’t know," said quilting guild member Caroline Sobolak, who works in the Grants Office. "I look forward to it every month. We’re helping others while being there for each other," she said. The MCCQuilters Guild began in 2010, when a group of five female employees gathered for lunch and bonded over their love of quilting and service. One of the members talked about making quilts for sick children. Soon, the women began sewing quilts after work. The group grew from that conversation, and today eight active members and several drop-in members gather once a month to design and sew quilts for homeless children. Some members without sewing experience sew or piece the fabric together, and experienced quilters sew on machines that they bring from home. Often, members will work on a quilt at home in their spare time to keep the projects moving along. Guild member Marilyn Schick, director of Computing Services, said she enjoys the camaraderie and the connection with American heritage. "This is the most cheerful, collaborative group I had ever worked with. It's different than being together with them in (work-related) meetings during the day. I supervise some of them during the day, but in the evenings, they supervise me; they've taught me how to quilt," she said. "As I got interested in quilting, I read up on it and I was impressed with how women, throughout history, always quilted and joined quilting bees," Schick added. "It's functional and an art form very unique to women. Nowadays, I don't think we have an opportunity or reasons to get together as women did 100 or 150 years ago. When we come together, we're continuing a tradition that’s part of our American heritage." "In addition to being a very practical thing to donate to the shelter, the quilts prove to our clients that members of the community care about what they are going through and want to help. That is invaluable," said Turning Point coordinator Jennifer Kenning. "Clients will be able to take the items with them when they leave our shelter. It was a very generous donation and the quilts are beautiful! They really brighten the rooms and give them a homey feel." Other guild members expressed that they enjoy the group because of the fellowship and the excitement of the quilt recipients. Opening the guild to students has stirred some enthusiasm as well. Guild members said they hope more students will join them in January when the members start making larger quilts to benefit adult clients at the nonprofit agencies.